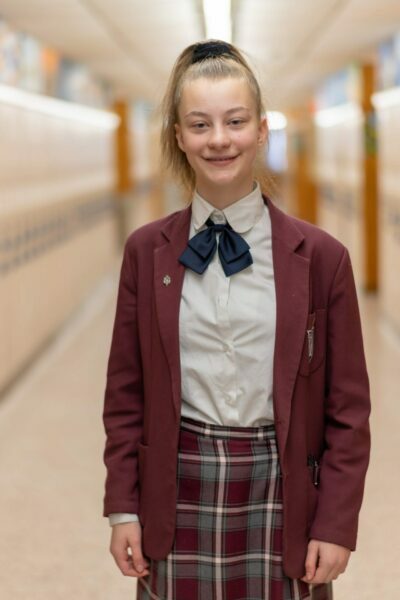 On Tuesday, October 16, the Brother Joseph C. Fox Latin School had its annual Spelling Bee in the Kellenberg Memorial High School auditorium. Thirty-two contestants from grades six, seven, and eight battled through eight rounds of challenging words such as fluorescent, correlation, nuisance, humorous, and prominent. The students continued with endless energy until it came down to the last two winning words – “proclamation” and “compulsion”. The winner of the Spelling Bee was Emily Carroll of 8A, and the two runner-up winners were Eileen Benenati of 7A and Ryan Lane of 7C. Congratulations to Emily and all the students who participated in the Spelling Bee!